Sometimes we walk through a season of life that feels like a wilderness. Barren, lonely, forsaken. We might even feel like this is the end. That things are hopeless. That’s where Elijah was when he fled Jezebel. He went out in the wilderness, sat by a tree, and asked God to let him die. Instead, God gave him food and water and sent him to Mount Horeb (1 Kings 19:1-8). There, Elijah made his complaint. “Then he said, ‘I have been very zealous for Yahweh the God of hosts, for the Israelites have forsaken your covenant. They have demolished your altars, and they have killed your prophets with the sword. I alone am left over, and they seek to take my life'” (1 Kings 19:10, LEB). Yahweh responds by showing His power, reassuring Elijah that he was not the only believer left, and giving him a job to do (1 Kings 19:11-18). Elijah thought things were hopeless but God had other ideas. He had a plan for Elijah and an even larger plan Elijah didn’t know about. God might not respond exactly when and how we want Him to, but He will respond. He doesn’t promise to take us out of our wilderness, but He does promise transformation. Water is seen as a source of life. It is also used in scripture as a metaphor for the holy spirit springing up in us like a well (John 4:13-14) and flowing out from us (John 7:37-39). 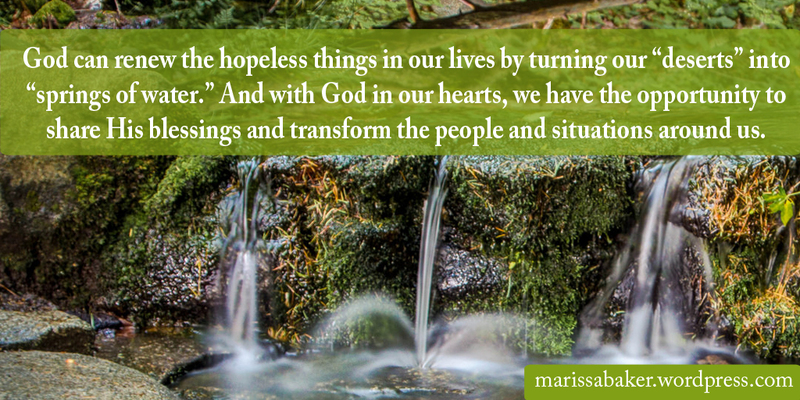 When God pours life into our hearts, it changes things. We become different people and that affects how we see what’s going on around us. It can also transform our surroundings. I started this study after a verse in Psalm 84 caught my eye. This is a psalm that talks about longing to worship God and the blessings found in association with Him. “Baca” can be translated “weeping.” Adam Clarke’s commentary calls it a “barren and desert place,” and points out that some manuscripts use the word “mourning.” This is not a nice place. That is, until someone with God in their heart walks through. As God blesses us, we gain the opportunity to be a blessing to others. God isn’t selfish. When He gives He gives more than enough. And the more you keep sharing your blessings with others, the more He keeps giving to you. Proverbs presents the same principle: “He who waters shall be watered also himself” (Prov. 11:25, WEB). There’s a cycle of blessings. God blesses you, which makes you able to bless others, which keeps you selflessly and humbly open to the work of God which means more blessings. Some of us are hesitant to give to God or others because we think we won’t have enough left over for ourselves. It doesn’t make sense by human logic that if you give away your money, time, effort, etc. that you’ll get more back. But that’s what God promises and He invites us to prove Him right. Instead of turning in on ourselves when we’re in a wilderness, turn outward. Remember God’s promises to bring life into your deserts. With Him in your heart, you can pass through the valley of weeping and make it a spring of life-renewing water. Hi Marissa, What a beautiful way to start the day with your devotion. Mal 3:16 allowed us to get out of debt. We started taking our tithe out of our paycheck first, THEN paid our bills. I used to leave the tithe to be taken out AFTER the bills were all paid. Money was always short and there was never enough to tithe like we wanted to. Luke 6:38 always is a picture of a cereal box for me. You buy a box at the store and when you open it after is has been brought home and shaken around in the car, the cereal is way down in the box. Not in God’s economy – He purposely shakes our cereal box, so to speak ,and pours in so much more that it overflows. Blessings – changed my name- instead of my full name I now just put my initials.